The AlarmCloud is our latest developed system. 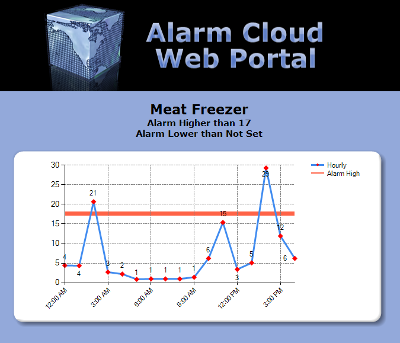 It has been made to monitor refrigerators, freezers, and coolers in real time. This service provides constant access to the temperatures received from each reading. This system gives you freedom to set it up exactly the way you want it. Once it’s installed, you can have peace of mind knowing that the AlarmCloud is watching over all your refrigeration systems. 24/7, 365 days a year remote monitoring. 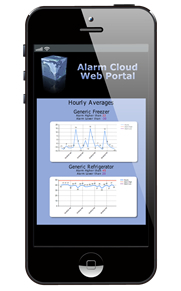 Ability to look at cold storage temperatures in real time by logging in through the AlarmCloud Webportal. Real time notification when temperatures exceed user-defined tolerance levels. Ability to look at reports to see hourly and average temps for each cold storage unit for today, yesterday, 7 Days, 30 days all the way up to 12 months. Reports can help you analyze the condition of cold storage units and allows the ability to be proactive to arising problems. All information can be accessed through a web browser on your computer or through a smart phone. Low setup cost and monthly monitoring cost. 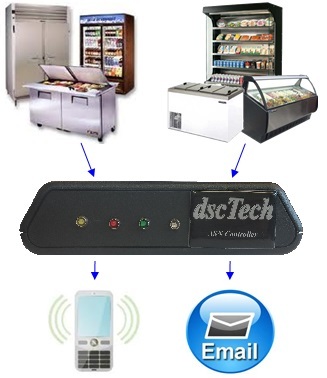 Setup and configuration for temperature thresholds and notifications are simple and quick. Reports represented in both textual and graphical form. Has support for mutiple notifications through email, text, or phone call to multiple people. Technical support is a phone call away. Click here to contact dscTech for more information on AlarmCloud Services.